A letterpress drawer is a thin wooden tray with compartments. These drawers were part of a larger printing cabinet that were common between the 15th and 19th centuries. The small sections store letter stamps or "sorts" that were used in a printing press for relief printing. Letterpress drawers are also referred to as type cases, type drawers, printer block drawers, and printer's trays. Some people are lucky enough to find a tray or an entire cabinet in their attic, but this is a much less common occurrence since the popularity (and cost) of this antique has increased. Nowadays, antique enthusiasts search high and low at antique shops for the chance to own one. Some people even buy reproduction printers blocks to achieve the look. These letterpress drawer ideas will help you transform the tray you already have or inspire you to go out and find one yourself. Letterpress drawers are commonly used in antique shops and flea markets to display small collectibles for sale. Implement that same idea in your home by housing a miniature collection in a drawer and placing a piece of glass on top. Letterpress drawer compartments are the perfect size to display jewelry. Simply hang the wooden tray on a wall and add eye screws in each compartment. For added storage, hang larger hooks on the bottom panel for scarves. Find the letterpress tray jewelry organizer shown on Zounds Designs. This letterpress drawer idea is perfect for people who like to sew, but you don't need to sew to recreate this idea. 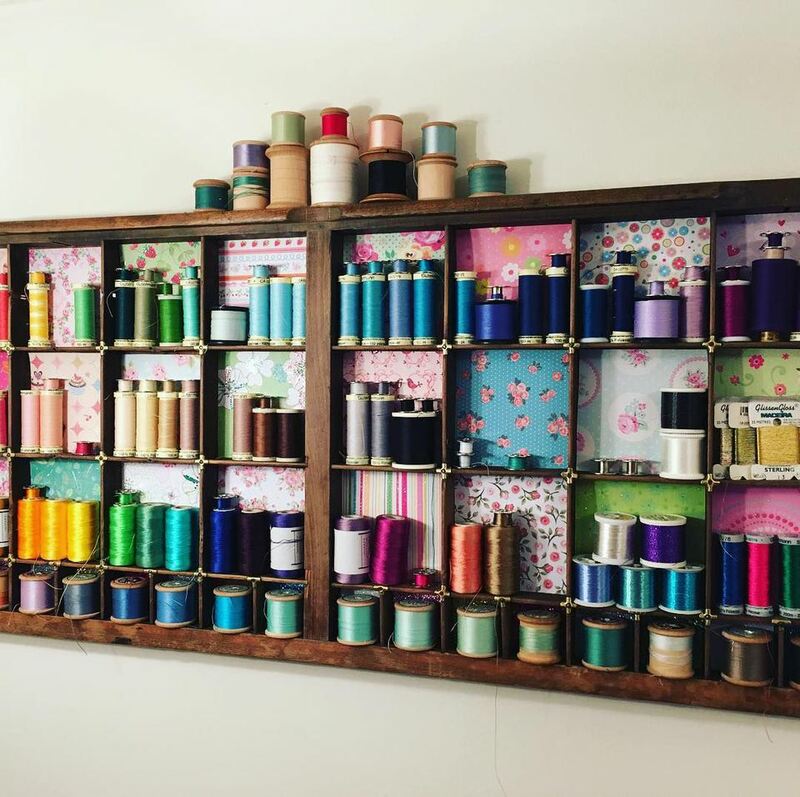 Pick up a lot of vintage thread spools and create a fun visual for not a lot of money. To take the concept even further, gather varying patterns of vintage fabric and line the back of each compartment. There are a variety of plants you can use to create a vertical planter in a letterpress drawer, but the two easiest to work with are succulents or air plants. For plants that need more water, make sure to line the inside of the wooden compartments before adding soil. View the pictured vertical succulent garden at Dukes & Duchesses. Letterpress drawers make perfect shadow boxes that can be changed out and rearranged often. This particular set up incorporates dozens of eclectic antique items. Originally, letterpress drawers would have been in a tall wooden cabinet. Antique letterpress cabinets are prized by printers and collectors, but sometimes the drawers do get sold off separately. If you can't afford a full cabinet but want the functionality of a drawer, recreate a table like the one pictured. Bonus Furniture DIY: Instead of making a table, transform a letterpress drawer into a wall cabinet by building a cabinet frame and using the drawer as a door. Jewelry is one of the more common vanity items stored in letterpress drawers, but there are other personal items that fit perfectly, like essential oils. Sort bottles by color to make the storage solution more sightly. Another easy item to store in these compartments is a collection of nail polish or lipstick. One of the most creative ways you can transform a letterpress drawer is by turning it into a piece of art. The simplest way to do this is to find a variety of colored paper and line the back of each compartment. Pick between four or five colors that coordinate with your home decor and randomly place each sheet after you cut them to size. Firmly position the paper underneath each section without using glue. This allows you to change the look if you get sick of it. Decoupage a map to the back of the compartments and display trinkets from your travels. Cut out different photos to fit in the back of each compartment to make a large photo collage. Paint the background in an ombre pattern. Use scrabble pieces and write out a message with words scattered throughout different compartments. Letterpress drawers were originally used for storage, so why not make use of them to help you organize your craft room? There are a variety of tiny craft pieces that will fit within the compartments and not necessarily fall out if the tray adheres to the wall. This letterpress drawer idea could work as functional storage that your kids have access to in their playroom. The other option is to create a shadowbox using a piece of glass so that your kids don't have access to the miniatures all the time. Either way, the drawer can keep a collection of little toys that your child loves. Turn your printer's tray into a fun adventure for your kids by making a cabinet of curiosities. This idea is inspired by the book Cabinet of Curiosities: Collecting and Understanding the Wonders of the Natural World. The book explains how science classifies objects and teaches children what to do with specimens they find. What's especially fun about the book is that it teaches kids how to create their own cabinet by preserving things like crab shells, robin's eggs, and even spider specimens. This idea isn't limited to children. Collect miniature objects on your travels and create your own whimsical cabinet.